Nichinan Panayuzu is a 5% fruit beer from Nichinan Beer, based in Miyazaki, Japan. It’s part of their all-year round lineup and can be found in bottles at the time of writing. It contains locally sourced yuzu, known as Japanese citron, and the name comes from “hanpa yuzu peel” which means “a lot of yuzu peel”. Nichinan Panayuzu poured out a light golden colour with surprisingly little haziness considering the bottle proclaims this to be a fruit wheat ale. The yuzu was easily detectable from the get go, along with a slight bready nose to it as well. The yeast came through with a slight funky sourness to it, which only got stronger as Nichinan Panayuzu warmed up. The underlying hint of coriander brought some spicy kick so it wasn’t just yuzu while drinking. The body of Nichinan Panayuzu had the yeast kick to it that I knew was coming from the nose – it wasn’t overpowering but it let you knew it was there. It had some wheat flavour to it but when you have yuzu in a beer, you can expect to taste it somewhat. Nichinan Panayuzu didn’t let me down and the yuzu came screaming through, bringing a citrus tartness to the backend of the flavour. The yuzu carried on through into the aftertaste, before leaving a somewhat sticky residue to the palate. 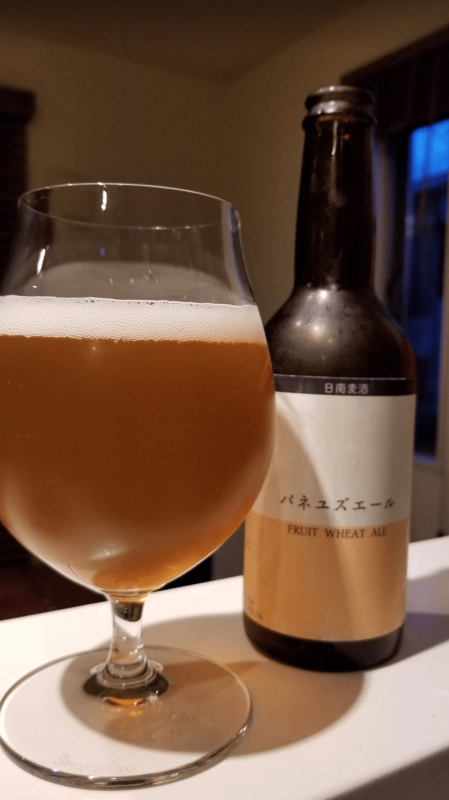 Dial back the yuzu, and let the wheat come through a bit more and then Nichinan Panayuzu could be a nice beer to drink.